Media 5 SRL has integrated its M-MAM asset management platform with Quantum Xcellis™ workflow storage and multi-tier archive products, providing a single solution to simplify deployment and lower the cost of managing video, audio, and rich media assets for broadcast environments. With a strong presence in Latin America and growing business elsewhere, Media 5 provides a lowcost solution to manage your assets from ingest to cataloging to publish to archive. 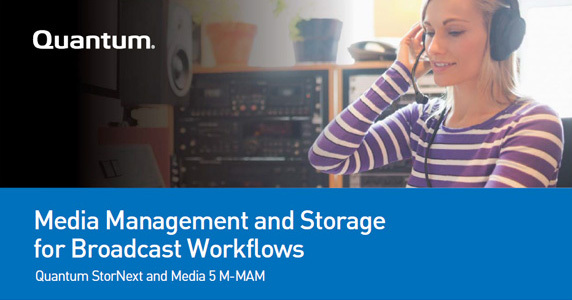 While many media asset management solutions provide partial solutions to broadcast production workflows, Media 5 M-MAM manages content for the full life cycle. The ability to ingest directly from recording systems or drag-and-drop, catalog content through pre-defined templates, search, apply process control, publish to playout servers and social media, and archive your finished content provides an equally complete workflow for established as well as new broadcast channel providers. Just as M-MAM provides a complete workflow for broadcast, Quantum StorNext® provides the most flexible scale-out storage that works for ingest and edit just as well as it works for archive functions. Quantum Xcellis workflow storage answers the question of whether to use SAN storage infrastructure, a staple for ingest, edit, compositing, and streaming functions; or NAS infrastructure, common in rendering and transcoding. Why not use both? Xcellis offers a converged infrastructure providing high-throughput shared SAN access to your content for workflows that require no dropped frames and NAS protocols for fast random reads and writes. Additionally, the StorNext Storage Manager functionality works in combination with M-MAM to move media files from fast, primary disk to either low-cost LTO tape, object storage, and/or cloud tiers. 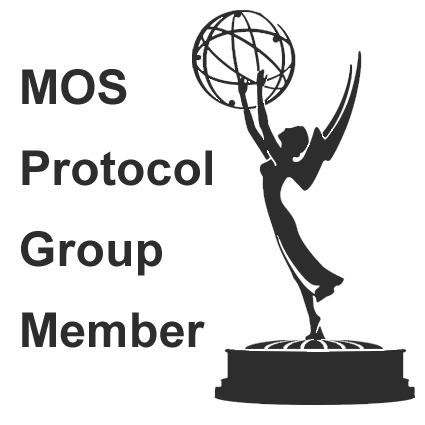 M-MAM’s workflow creates low-resolution proxies online and uses its API integration with StorNext to store the high-res versions of content to an inexpensive archive tier. Assets can be cataloged and protected for future access and remonetization. Media 5 has its origins in radio automation broadcast solutions over 25 years ago. It offers a strong product line as a manufacturer of video playout servers, studio and mobile recorders, and character generators. Its M-MAM media asset management solution is an expansion from this broadcast base, drawing from a full automation workflow while introducing a solution providing cataloging in a central SQL database, watch folders, user control, and automated transcode and delivery features. M-MAM remains true to its video server and CG roots, providing tight integration with graphics, branding, and multi-channel/multi-format playout. Some advanced features, such as the time shifting function with its integrated video server and userdefined broadcast reports, are examples of the crossover between Media 5’s broadcast heritage and M-MAM functionality. While Quantum StorNext was originally stronger in the post-production industry with its strong Apple Xsan ties and in large broadcasters, it also has expanded much more broadly into call letter stations, sports teams, and houses of worship with the introduction of its Pro Solutions. StorNext Pro Solutions provide the fastest, easiest, and most complete high-performance storage for today’s complex collaborative workflows. Each Pro Solution has a targeted application, ranging from Xsan replacement, 4K content production, and new facility deployment, to a full content production and ownership storage solution. One of the primary benefits of a media asset management solution is the ability to maintain an archive of content for preservation or reuse. M-MAM has a builtin workflow to produce low-resolution proxies online with its own transcoding features for trimming, checking, and logging while archiving the high-resolution version for future conforms. M-MAM controls the physical content across online, nearline, and offline tiers in combination with StorNext. By integrating with StorNext web services APIs, M-MAM provides more granular control of the assets—providing the ability to archive content to LTO tape archives, Lattus™ object storage, or Q-Cloud™ public cloud tiers. While some storage solutions assume all assets are stored on the same expensive NAS tier once the content has been produced and distributed, StorNext can automatically store less-frequently accessed content on lower-cost storage, such as LTFS-formatted tape or low-cost disk. The StorNext AEL Archive appliance integrates Quantum hardware and software to deliver a reliable, high-capacity archive intended for the long-term storage of nearline content. The StorNext AEL Archive provides many advanced features for long-term preservation, such as policybased tape data integrity checking, giving customers the additional assurance of knowing that the data on their tapes is being tested and validated on a continuous and ongoing basis. Tested by years of successfully deploying solutions in the competitive, price-sensitive Latin America market, Media 5 solutions offer lots of functionality for reasonable cost. Combined with StorNext’s ability to move content off expensive disk to lowercost tape or cloud archives, Media 5 and Quantum can offer a cost-effective solution for new broadcast workflows. M-MAM integrates tightly with its own playout, recording, and character generation products, but it also has integration with third-party ENPS systems, MOS and iNEWS and other protocols, 2D and 3D character generators, and playout servers. In addition, Media 5 has multiple products that provide add-ons to NewTek TriCaster environments. In addition to handling front-end video production workflows requiring SAN and NAS unified access across Windows, Linux, and Mac platforms, Quantum’s Xcellis Workflow Director also includes the ability to move content to a broadcaster’s choice of tiers of storage, including LTO tape, object storage, and public cloud. StorNext AEL Archives use the LTO-7 tape format, providing the ability to store 6TB of uncompressed data on a single cartridge and considered 76x cheaper than storing long-term data on disk*. This is important for broadcast environments concerned with space, power, and cooling costs. The same StorNext API integration that gives M-MAM access to LTO tape archives gives access to object storage (Lattus) and public cloud (Q-Cloud). Quantum’s Lattus-M combines next-generation object storage technology with the StorNext Storage Manager data mover in a highly durable, scalable, and efficient disk-based archive. Q-Cloud Archive and Q-Cloud Vault leverage AWS S3 and Glacier cloud storage platforms, respectively, to move content targeted for archival to the cloud.